Miami is so hot right now. Everyone wants to know what we have to say, what we like to do, how we like to dress, what we like to eat. As freelance writers, the world's love for Miami makes our job so fulfilling because we get a lot of platforms through which to share how much we love our city and how awesome our fellow locals are. The most recent outlet to which we've started contributing is Beyond Worlds, a digital lifestyle magazine inspired by the work and life of best-selling author Sylvia Day. 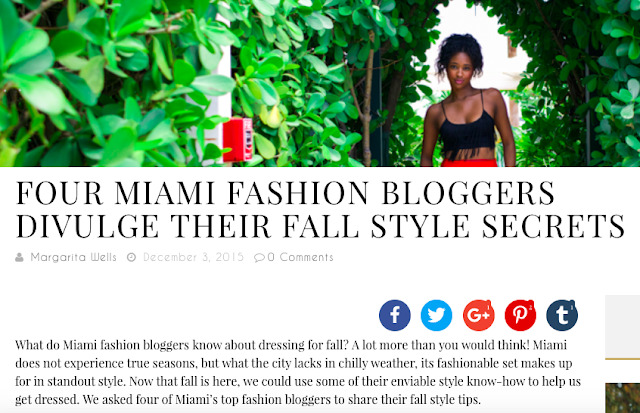 For our first piece, we tapped some of our fellow Miami fashion bloggers for advice on how to dress for fall. Read the excerpt below and click on the image for the full feature starring these four of our favorite creative and chic ladies. What are your fall fashion tips? Which tip did you find most helpful? Which of the four distinct personal styles do you like best? What other advice or topics would you like to see us cover for Beyond Words? Leave a comment below or send us a tweet @ThankYouMiami!